Powers: Wargod possesses no superhuman abilities. In combat, she wears a suit of protective armor, and wields a powerful warclub that releases bursts of electricity. In her civilian identity, she carries a gas gun in her cigarettes. History: Convinced of the military's supremacy, and that the military should be in control of the United States, Mora Hagert donned the Wargod costume to spread insurrection. (Marvel Comics Presents#80/2)- FBI agent Jake Bage came too close to learning the secrets behind her operations, so Wargod invaded his office and killed him. Before she could escape, Captain America arrived, and she knocked him out the window, giving her enough time to destroy Bage's files-- although she overlook a taped message which Captain America later uncovered, informing him that Wargod was involved in Able Electronics. At Able Electronics, in her civilian identity, Mora attended a press conference with her father and his aide, Major Duner. Later that day, she and her men assaulted FBI agent X-4, who was protected by Captain America. Wargod resolved to deal with Captain America once and for all; as Mora, she attended a meeting between him and her father, then knocked him unconscious with a gas gun-cigarette. (Marvel Comics Presents#81/2)- While her men attempted to transport Captain America away, he revived, and defeated them. Mora's conversation with her men had been overheard by Major Duner, so he was taken captive. 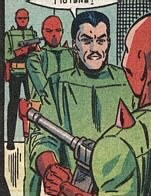 She also captured Senator Weason and her father, to use as hostages against Captain America when he invaded her base. The two fought again, with Wargod destroying the improvements Able Electronics had made to Captain America's shield that were meant to protect him from her warclub. Captain America seemed to surrender, but at the last minute, threw his shield at Wargod, knocking off her helmet. Her henchmen were held back by the freed Major Duner, and she was taken away. Comments: Created by Steve Ditko and Terry Austin. 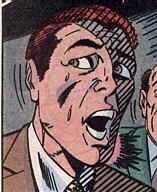 Need it be said that this story was written by Ditko? I thought not. Thanks to Will U for compiling the list of War Gods! Sakhmet, aka Mehit, Sekmeht--Egyptian--who is known as the Lion God in the Marvel Universe. The Wargod's Agents were typical green-garbed thugs, equipped with firearms. One of them had infiltrated Able Electronics. 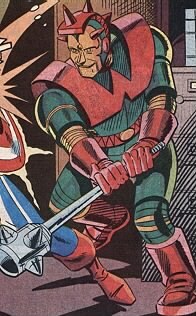 Brad Rever was the head of Able Electronics, and aided Captain America in developing technology to defend him in combat against Wargod. However, his son Dan was secretly using the company's equipment to aid Wargod. Dan Rever was Brad Rever's son, and was secretly selling the company's products on the black market. He was apparently responsible for providing Wargod with the device needed to nullify the improvements made in Captain America's shield. General Hagert retired from the military in anger over America's weak defense policy. He believed that America needed military supremacy, making him an enemy of Senator Weason. Even being captured by Wargod and learning she was his own daughter did nothing to change the General's viewpoints. Senator Weason was General Hagert's political opponent, and believed the military should only be used for protection. His capture by Wargod did nothing to change his viewpoints. 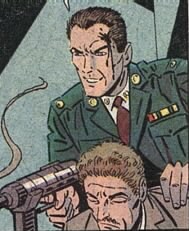 Major Duner was General Hagert's aide, and was believed by Captain America to have been Wargod himself. He was captured by Wargod after overhearing her talk to her men, but freed himself in time to save Captain America from Wargod's henchmen.